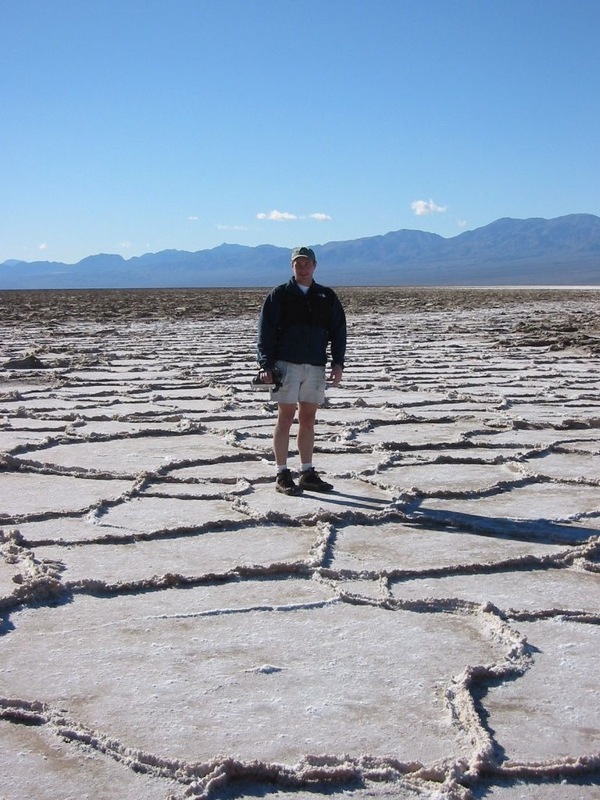 With all the talk about the record breaking heat this week on the west coast, I thought it might be appropriate to write something about Death Valley National Park. 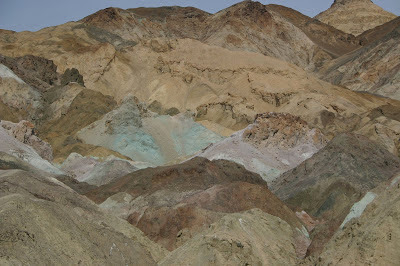 Death Valley, where it's possible to see the earth naked. Mark and I made our first trip there in 1992, when it was still a National Monument (Mark had been there once when he was a kid but all he remembered about it was the pool at the resort.) At the time we were working for an environmental lab and I talked with a lot of geologists in the course of the workday; most of them couldn't be more enthusiastic about the place and swore we would love it once we got there. So we planned the trip for early April, when the weather was supposed to be just on the cusp of warm-but-not-hot and off we went. We had no idea how popular Death Valley was. We waltzed in with no reservations, expecting we could just pick out a campsite and stay for the week. Spring and Fall are the most popular times to visit, and the weeks surrounding Easter are some of the most crowded. We showed up in our Ford F150 with it's camper shell on the back (this was before our current rig) and were greeted by the now familiar "Campground Full" sign. Augh! The ranger pointed across the street to what looked like a gravel parking lot and told us we were welcome to stay in overflow tonight and check back in the morning for openings. The "campground" across the street was euphemistically named Sunset: I'm not sure if it's namesake was the large numbers of retirees present that were enjoying their sunset years, or the fact that when the sun sets, it's rays blast directly across the valley and roast the campground. 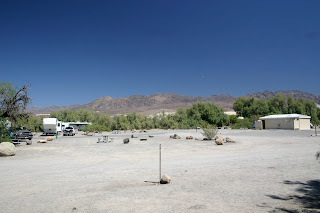 It was a huge graded gravel parking lot with one set of pit toilets in the middle, the open space set up to accommodate those big RVs the size of city buses. I think the toilets were just decoration; some of the RV monster-mobiles looked like they came equipped with their own waste treatment plants. We tried to make the best of it and unloaded our chairs, made a table out of our cooler and crammed ourselves into the sliver of shade made by the side of the truck. 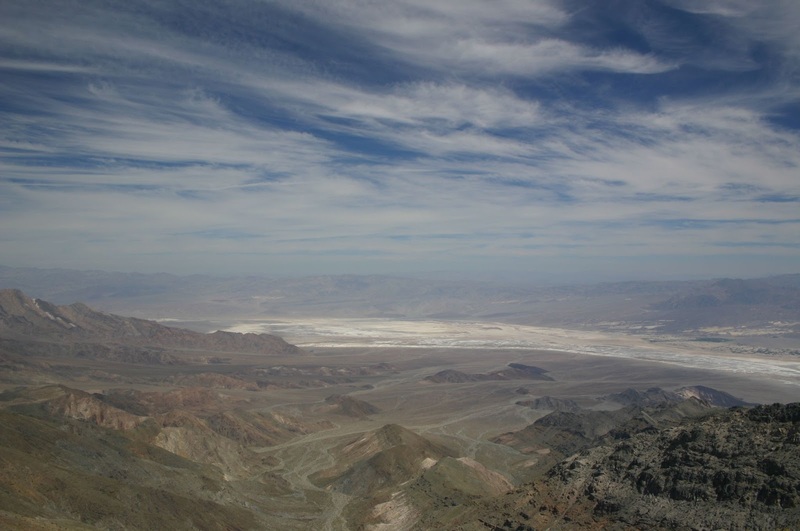 While April is still considered cool in Death Valley, cool is a relative term. We had just left a cold, rainy spring day that morning, so suddenly finding ourselves sitting in a blinding white/gray parking lot in 90 degree weather was a bit of a shock. Dazed, we watched as the RVs lumbered in, leveled themselves with fancy hydraulic systems, cranked out their living room-sized pop outs, and fired up their generators, presumably to run their air conditioners, microwaves and satellite TV systems. Amazingly, we never saw anyone emerge from some of them. They were self-contained micro-environments that ran on huge tanks of diesel. We wondered why they bothered to move them at all, but I guess they liked to change the view outside their bay windows once in a while. We made some sandwiches (because we just couldn't face lighting the stove) and sat studying the map of the park, plotting the next day. Death Valley is a huge park and the attractions are spaced out along the length of it. 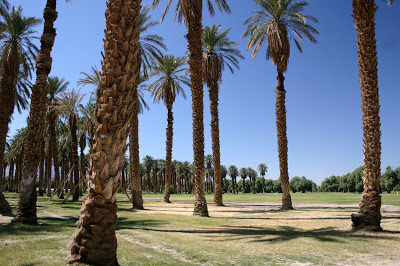 We had purposely chosen to stay in the Furnace Creek area because it's centrally located; it would reduce the amount of drive time to get to either end of the park. 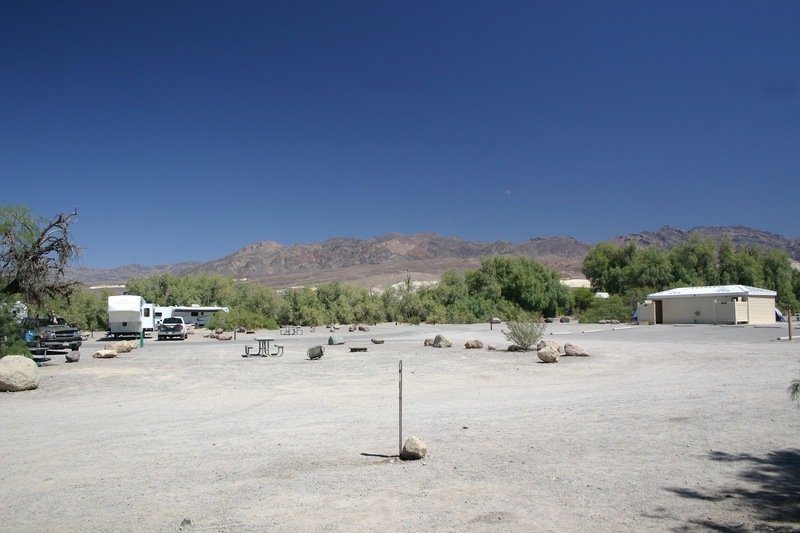 Furnace Creek Resort has cabins and a motel along with a couple of restaurants and a general store so it's convenient in that way as well. It's easy to find when you go--look for the only green spot for 100 miles. Death Valley actually has a lot of water, you just have to know where to look; there's an underground aquifer and several springs around the base of the mountains. 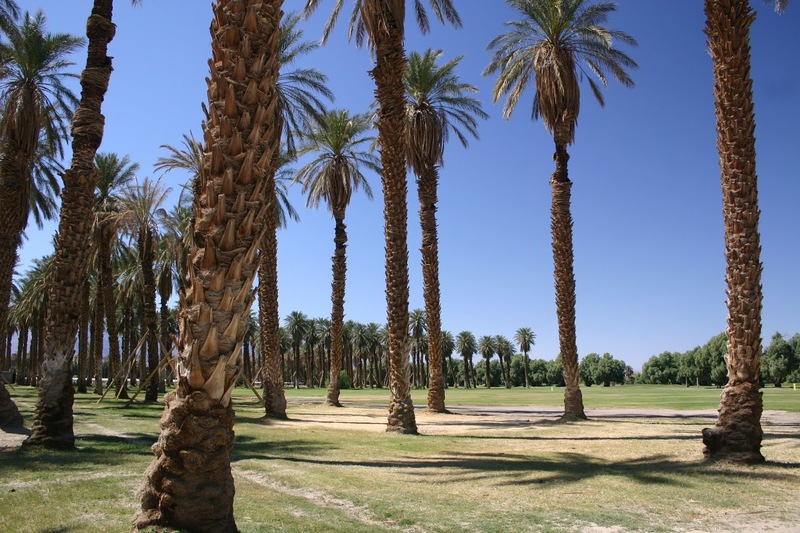 The resort has taken advantage of this and maintains a golf course and date palm orchard. I don't play golf and I know environmentally it doesn't make sense to pour water out onto one of the driest places on earth, but there's something soothing about looking out over an expanse of green grass after spending the day squinting through the heat waves in the valley. First thing in the morning, we packed up and drove across the street to see if we could get a spot with a little shade. Luckily for us a perfect spot opened up. The rangers reserve the sites in the trees for tent campers for the shade and shelter from the wind. 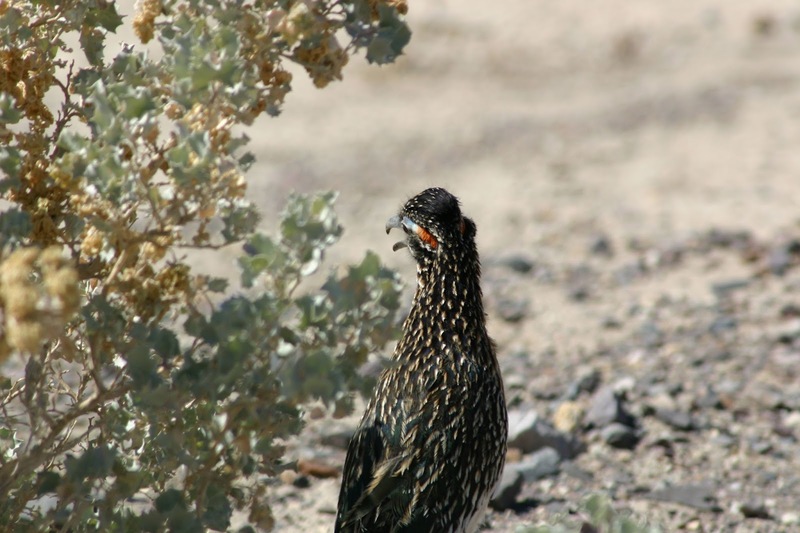 We were lucky enough to score a site with a tree, which had a resident roadrunner family living in it. The ranger grilled us a bit before assigning us the site. They are very protective of the wildlife there; it's tough enough making a living in that environment and human harassment would be the last thing the poor creatures need. and now have greater sympathy for Wile E. Coyote. We pulled in and set up camp. We had the tent with us, but considering the location and the amount of wind we had the night before, we decided to sleep in the back of the truck for the night and see how it went (Because of the huge fluctuations in temperature in the valley and surrounding mountains, wind is an ever present possibility. In the afternoons in the spring, the wind kicks up to gale force quickly and carries dust and debris along for the ride.) It only took a few minutes before our neighbors started wandering over and introducing themselves. Wendell (and his wife, who in a weeks' time we never saw) were from Washington state and drove an impressive fifth-wheel trailer back and forth to Mexico every year. The bachelor Berkeley was a retired college professor in a rickety old camper on the back of a small Toyota truck, also from Washington. They had both been camping there for a few days and had forged an Ernie and Bert type relationship, bickering with each other as they sat in their lawn chairs drinking beer. When they saw us pull in they walked over and sat down at our picnic table, telling us about the roadrunner and asking about our "rig". Little did we know that these guys would be permanently attached to our table for the rest of the week. As far as we could tell, they never left the campground. 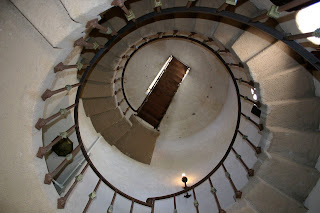 We'd go off for the day exploring and when we returned, there they were asking about our day. It was like having two ugly housewives, but without the advantage of dinner waiting for us on the table. It would have been irritating but they were entertaining and informative; they had both been to Death Valley many times and had a lot of information about the area. It was our first lesson in campground hierarchy--the young and inexperienced can pick up a lot of helpful information from the old campground guard. 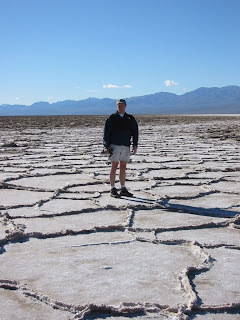 The first full day there we made a run south to Badwater Basin, the lowest point in North America at 282 feet below sea level. We parked there and walked out onto the salt pan, the sun bouncing off the bright white surface and sneaking in through the bottom gap in our sunglasses. It was uncomfortably warm and the morning was only in the 70s. I can't imagine what it's like in the summertime when the temps get up into the 120s; I think my shoes would have melted, followed by my eyeballs. 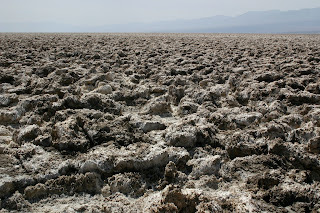 That side of the valley also features the Devil's Golf Course, a huge field of cracked salt pan that's been heaved up by the cycle of rain and heat. If you walk out onto it and listen closely you can hear the crackling as the salt dries and contracts. It's eerily beautiful the way the salt sparkles and makes patterns that run down the valley for miles. 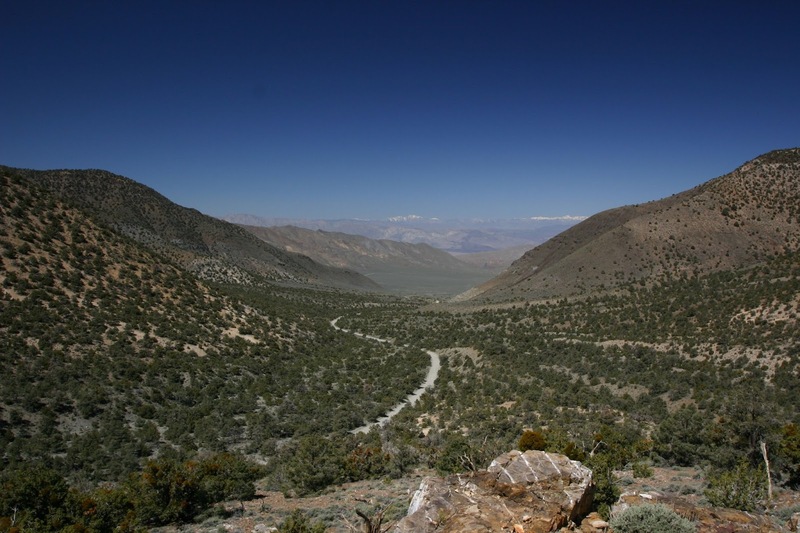 Driving back toward our camp, Artist's Drive is a one way loop through an alluvial fan that spills out from the Black Mountains. Mineral deposits create colorful layers in the exposed rock and soil; it's a great place to take pictures in the afternoon when the light makes the colors really stand out. It's a good thing we did the south end first on that trip; that afternoon clouds gathered over the mountains and unleashed enough rain to create a flash flood that wiped the road out between Furnace Creek and Badwater Basin. It rains an average of 2.36 inches in Death Valley annually and we were lucky enough to be there the day most of it came down. It was pretty dramatic though; we watched through our binoculars as the muddy rush of water came down out of the mountains, a scary sight made better knowing we were in a safe place. 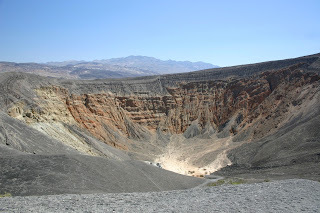 We explored the north end for the rest of the trip, visiting Ubehebe Crater, a gigantic hole created by a volcanic explosion. 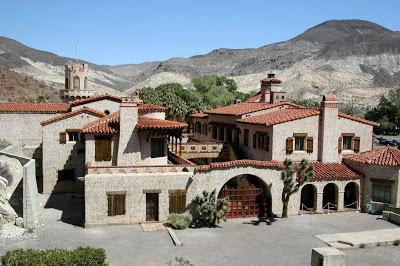 We also took a tour of Scotty's Castle, a villa built in the 1920's and used as a winter home by Albert Johnson and his wife, a wealthy couple who came west to the desert for health reasons. The park purchased the house after the Johnson's death and docents dressed in period costumes conduct tours for a small fee. 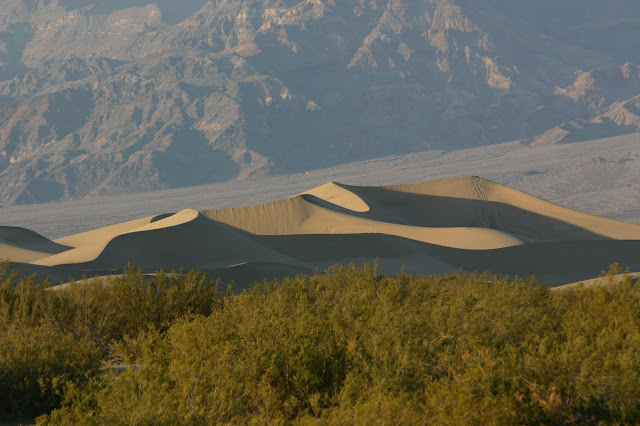 We spent a morning walking around the Mesquite Flat Dunes, a huge expanse of sand piled up by the strong winds that run up and down the valley during the year. It pays to get up early in the morning for these; there are all kinds of nocturnal creatures that leave interesting tracks in the sand which get erased daily by the afternoon winds. We stopped in and did a little boardwalk hike set up along Salt Creek, home to the Salt Creek Pupfish. 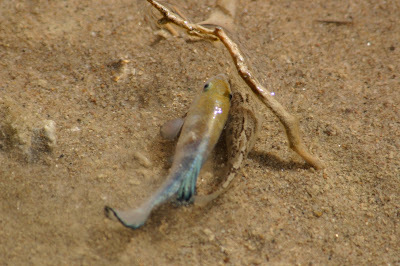 Yes, there are fish in Death Valley, and boy are they randy in the springtime. They have to take advantage of the relatively high water levels when they can, and since it had just rained they were out in full force, the original speed daters. Salt Creek actually runs above ground all year, but it's length depends on the time of year and amount of rainfall. They are surprisingly pretty and we watched them jet around in the shallow water for a while, amazed by their very existence in such a dry place. Another little walking tour goes through the Harmony Borax Works, just down the road from Furnace Creek Resort. There's a nice display explaining the way borax was collected and processed, with an old double wagon on display that used to be pulled by the "20-mule team." 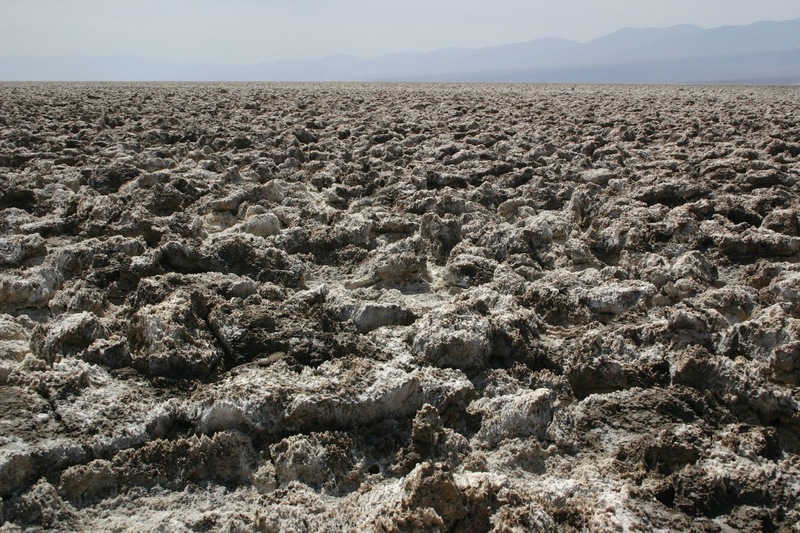 If it hadn't been so wet, we would have liked to hike out to see the "haystacks," remnants of the borax mining days when laborers would scrap up the cottonball borate into piles for processing. A one way road nearby winds through Mustard Canyon, hills that look like piles of, well, dry mustard. All the places we visited during this trip are accessible by car. There are several campgrounds in the park, including one at higher elevation, Wildrose, that is much cooler than the valley campgrounds below. Get yourself a high clearance vehicle though, preferably with four wheel drive, and hundreds of miles of back roads are opened up for you. There are four wheel drive accessible roads you can travel to reach dry camping spots in the park, and tons of old mining equipment scattered in the back country to explore as well. 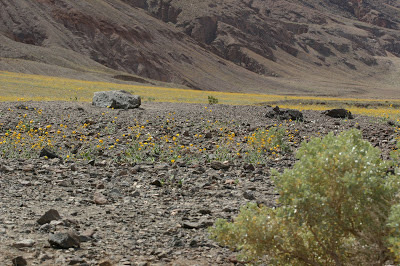 Death Valley during a desert bloom. This is about as good as it gets in the valley foliage-wise. 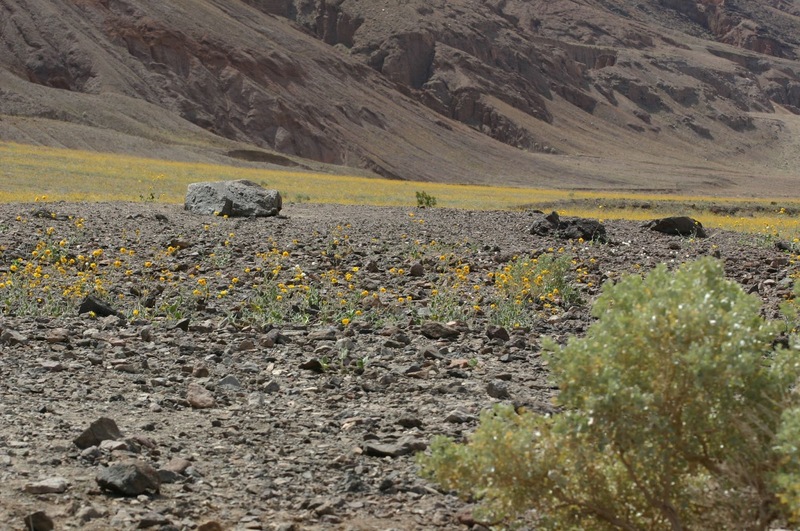 Although it's not as spectacular as some of the wetter desert parks like Anza-Borrego and Joshua Tree, after particularly wet winters the valley blooms in a blanket of yellow flowers. Death Valley is an amazing place that really gets into your blood and if you're like me, once you visit you'll be compelled to go again and again. There's something about being able to see the earth in it's raw form; there's no foliage hiding the uplifting and erosion of the mountains. And the night sky is full of more stars than you'll be able to see almost anywhere else in California. Death Valley's closest large urban neighbor is Las Vegas, 120 miles and a couple sets of mountain ranges away. OK, I'll admit, it can get hot sometimes.